Where do bumper cars go when their amusement park tenure is through? If they formally hosted visitors at Long Beach's The Pike theme park, they may be sitting next you in traffic. Instead of letting these classic cars turn in rusting relics, California builder Tom Wright turned them into street legal driving machines. The Pike opened in Long Beach in 1902. Located along the beach shore, The Pike offered a number of attractions, from roller coasters to a bath house. The park drew millions of visitors during its years of operation, and thanks to its proximity to Hollywood, The Pike is featured in a long list of films. The Pike had two bumper ride attractions. The Skooter was an indoor bumper car track while Dodgem was a traditional outdoor flat bumper car ride. The bumper cars were one of the longest lasting and most popular attractions at the park. The Pike closed in 1979 after the park's contract with the city expired. By that time, the park's popularity had waned and the city was eager to redevelop the pier area for new tourist attractions. The city demolished most of the park's structures, leaving behind a large amount of unused theme park equipment, including the park's iconic bumper cars. How did bumper cars go from the theme park track to the street? The process was a long one. Shortly after The Pike closed, a California car collector scooped up some of the park's waste. 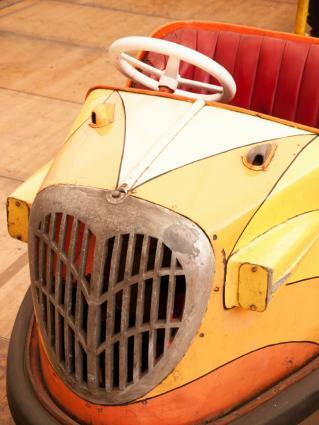 His plan was to renovate a bumper car and turn it into a piece that could be used in his family's living room. That idea never materialized, and his Pike collection sat untouched for a few decades. Eventually, the collector crossed paths with Tom Wright, a builder and painter by trade and amateur car mechanic/enthusiast. Wright spent a good deal of his childhood riding those very bumper cars, so decided to take one off the collector's hand. His plan was to tinker with the car to turn it into a fun ride for his grandchildren. Tinkering turned into much more. Leaving the original bumper car frame in tact, Wright built a new custom frame and installed leather material. Then he swapped out the engines, replacing the standard Harley engine in the cars with 750cc Kawasaki motors. With a little elbow grease - and $50,000 later - he had a street legal bumper car. Wright's cars are street legal, but they do have their limitations. Wright did not install a roof or convertible top, so they're not ideal for inclement weather, and they must be stored in a covered car bay or garage. Lack of a top also makes them risky in an accident. The cars are very low to the ground, which makes handling corners at speed dangerous. Speed, however, is one thing these bumper cars do not lack. Wright reports his cars can reach speeds of up to 160 miles per hour. Wright enjoyed the results from his first bumper car makeover so much that it became a full fledge obsession. He now has a fleet of eight bumper cars, some collected from other defunct amusement parks, including Coney Island. Wright has not sold any of his cars and instead simply shares them with family and friends. You can see pictures of his bumper cars in action on CoolThings.com.